Patterson Park Audubon Center connects people with nature through conservation and education. 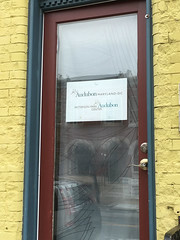 Patterson Park Audubon Center is part of Audubon Maryland-DC and has been actively involved in this Baltimore community since 2002, providing education programming with schools, recreation centers, and after school programs in Patterson Park. The education staff also provides public programs, including bird walks, Tiny Tot programs and family and adult programs in the Park for the community. We serve five of the elementary schools around Patterson Park, two after-school programs, as well as eight Baltimore City high schools. Several of these programs we offer in English and in Spanish. Audubon created a Native Garden for Pollinators to feed park wildlife. Strategically chosen, these native plants provide food for birds, bees, and butterflies. Audubon's wetland gardens provide native plants for native wildlife in Patterson Park while reducing runoff into the Chesapeake Bay. To volunteer in the gardens, contact Audubon at ppaudubon@gmail.com.